There is nothing as sophisticated as simplicity. 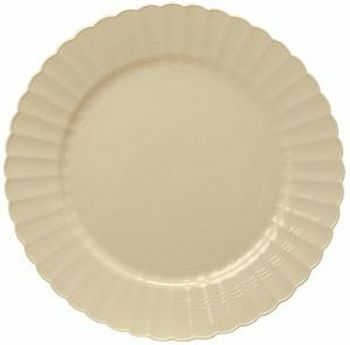 Yoshi Scalloped plates have a scalloped detail on the edge of the plate and a simple, unembellished center that gives your table the look of subtle refinement. Available in white, bone, clear and black, this line from Yoshi comes in four different size plates and two different size bowls. Yoshi "Reposables"- reusable/ disposable. Heavy duty. Scalloped plastic dinnerware. Great for use at weddings.